George and Amal Clooney have committed to help 3,000 Syrian refugee children go to school in Lebanon, Reuters reported on Monday. The new parents to twins Ella and Alexander aim to come to the aid of 200,000 children who are not receiving an education after fleeing the war in neighboring Syria. The Clooney Foundation for Justice has teamed up with Google and HP Inc. to help UNICEF and the Lebanese Ministry of Education open seven "second shift" schools, which includes special afternoon classes exclusively for the relocated Syrian children. Lebanon currently has over 1 million Syrian refugees, with around half of them children. "Thousands of young Syrian refugees are at risk — the risk of never being a productive part of society. Formal education can help change that," the Oscar winner and his international human rights lawyer wife said in a joint statement. "That's our goal with this initiative. We don't want to lose an entire generation because they had the bad luck of being born in the wrong place at the wrong time." The $2.25 million partnership includes a generous donation from Google and a $1 million technology grant from HP, the Foundation's website detailed. 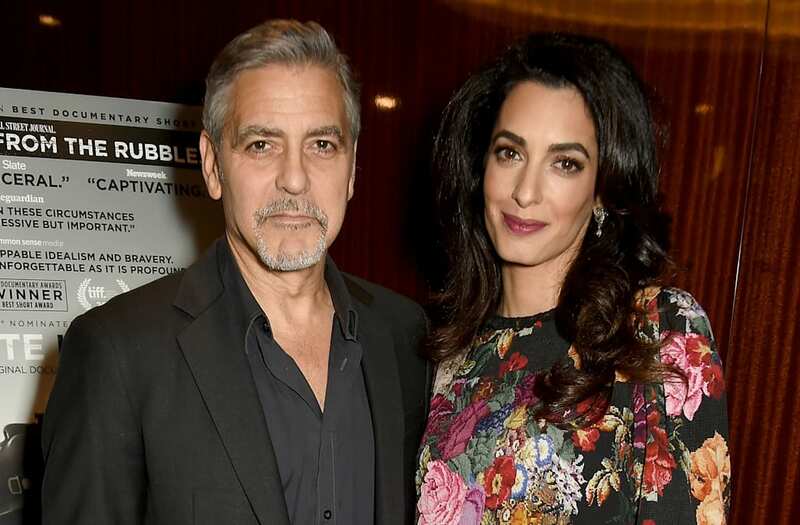 "The Government of Lebanon is profoundly grateful to the leadership of George and Amal Clooney and the Clooney Foundation for Justice," Lebanon's Minister of Education, Marwan Hamade said. "We are delighted the Clooney Foundation has decided to support our efforts to open the doors of more public schools to ensure we can offer every child currently living in Lebanon a free education. We are also looking forward to collaborating with the Clooney Foundation and its partners on advancing innovative technology in all our classrooms. "Each child given access to education, and new ways of learning, represents a life changed for the better. Today's grant from the Clooney Foundation for Justice is therefore a crucial investment in future generations in Lebanon," Hamade continued. UNICEF Executive Director Anthony Lake praised the Hollywood power couple's commitment, "By supporting the work of UNICEF and our partners to deliver education to every child affected by the conflict in Syria, the Clooney Foundation for Justice is not only investing in the futures of individual children, it is investing in the future of the entire region. UNICEF is deeply grateful for this critical funding."